The LANADO COMFORT MATTRESS OVERLAY has been upgraded to offer optimal comfort. You can now sleep on a thick layer of 1000 g/ m² wool to enhance the comfort of your mattress. 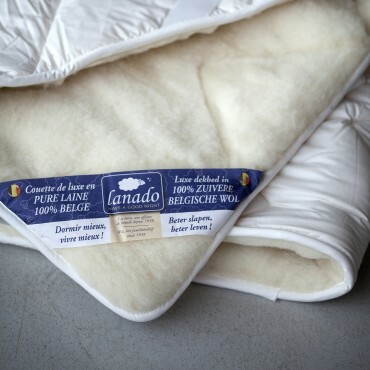 LANADO mattress overlays are filled with 450 g / m² 100% PURE BELGIAN WOOL. The WINTER side is made of 550 g/m² velvet wool and the SUMMER side in 100% Egyptian percale cotton, ideal for summer nights. Place them directly onto your mattress and attach them using the wide elastic tapes on each corner. Then just cover them with a 100% natural cotton or linen fitted sheet. You will thus be able to benefit from all the advantages of wool in both summer and winter. Wool absorbs moisture and perspiration thus enabling your body to maintain a comfortable and optimal temperature all night long, no matter what the season: your guarantee of a peaceful and refreshing night’s sleep. Wool produces little static electricity so it does not retain dust or odours; it does not soil easily and needs much less washing than other fibres. Sometimes just giving it a good airing is sufficient. This Lanado wool Comfort mattress overlay should be dry cleaned in the event of an accident or at the most once a year.